Iconographic descriptions enable us to understand the stories depicted on the altarpieces. High resolution (HR) photographs enable us to discover details that are difficult to see on the physical object itself. Infrared (IR) photographs enable us to see under paint layers and make the artist’s underdrawings visible. Following multimedia makes it possible to compare the painted layers and underdrawings, revealing differences between the original and the executed painting compositions. The text is based on research by Anu Mänd and Anja Rasche. HERMEN RODE (ca 1430-1504) was one of the most prominent painters in northern Europe in the Late Middle Ages. Little is known about Hermen Rode. There is hardly any mention of him in the Lübeck archives. He was likely born in the first half of the 15th century, was married but probably didn’t have any children, and died in June 1504. Looking at the altarpieces he created, Rode must have been one of Lübeck’s most important artists. Despite that, researchers have had a hard time pinpointing his artistic roots. Lübeck seems to have lacked artistic influences that helped him develop his style. Rode presumably spent his formative years in the western regions, either in the Lower Rhine region or in the Netherlands, where he learned new forms of expression. A number of altarpieces have been attributed to him, although only one bears his signature: the altarpiece of St. Luke, executed in 1484 for St. Catherine’s church in Lübeck (today in St. Anne’s Museum in Lübeck). One of Rode’s most imposing works of art is the altarpiece of the high altar of St. Nicholas’ Church in Tallinn. Several of the altarpieces attributed to Rode are today located in different parts of Sweden and seem to have been made specifically for the Swedish market, as they include depictions of national Swedish saints. Of these paintings, a few are now in the Swedish History Museum, and others are in churches around the country, e.g. the Sorunda and Salem altarpieces. In the case of large works, different stages of work were carried out by different masters, such craftsmen as woodcarvers, joiners, painters etc. The paintings on the winged altarpieces were executed by Hermen Rode, and the woodcarver(s) responsible for the sculptures is (are) in many cases still unknown. 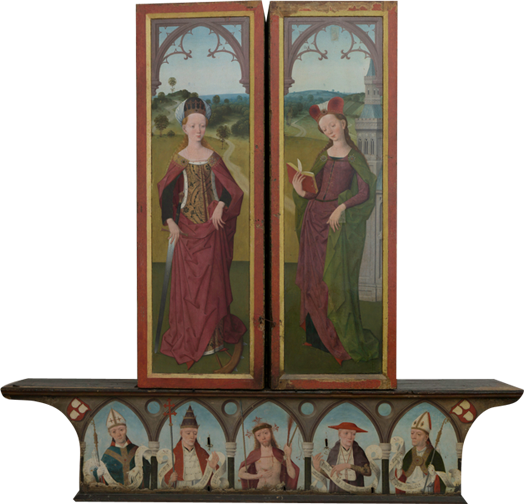 The retable was commissioned from the workshop of the Lübeck master Hermen Rode in 1478, and it arrived in Tallinn in 1481. The retable is one of the grandest and best-preserved northern German altarpieces from the Late Middle Ages, having the dimensions 600 × 350 cm. More than forty saints and biblical figures are depicted here. The town’s citizens made donations for the retable, the cost of which was 1250 Riga marks. Major donors were the Great Guild, an association of wealthy merchants, and the Brotherhood of Black Heads. Despite its small size, just 220 × 230 cm, the St. Luke’s altarpiece is considered to be one of the most representative altarpieces of medieval Lübeck. As an initiative of the Lübeck painter’s union, called the Maleramt, it was the focal representative piece for the local artists. It was created for the St. Luke’s altar in St. Catherine’s church, which was the church of the Franciscan friary. An inscription displays the name of the artist, Hermen Rode, and the year of completion, 1484. 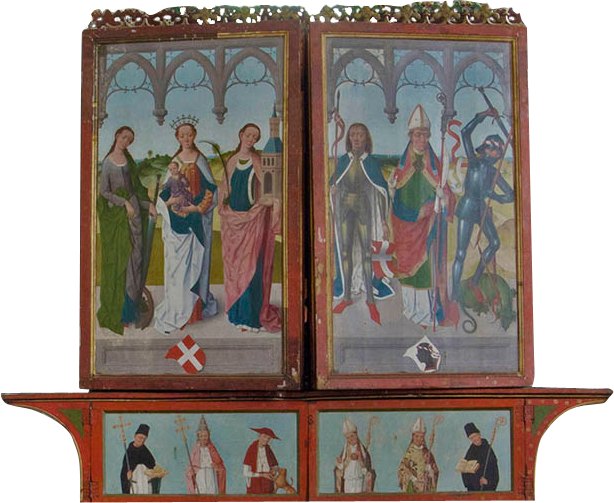 The retable was added to the “Public collection of antiquities and works of art” at the precursor of what is now St. Anne’s Museum in 1892.